This week will witness few interesting films hitting the marquee in Tollywood which has few big stars in the lead roles. This week will witness few interesting films hitting the marquee in Tollywood which has few big stars in the lead roles. Nani’s production AWE that stars Regina Cassandra, Kajal Aggarwal, Eesha Rebba, Priyadarshi, Murli Sharma, Srinivas Avasarala and Nithya Menen will be hitting the screens on February 16th, 2018 worldwide. The film has created a huge excitement amongst Telugu audiences with its unique content and creative first look posters. 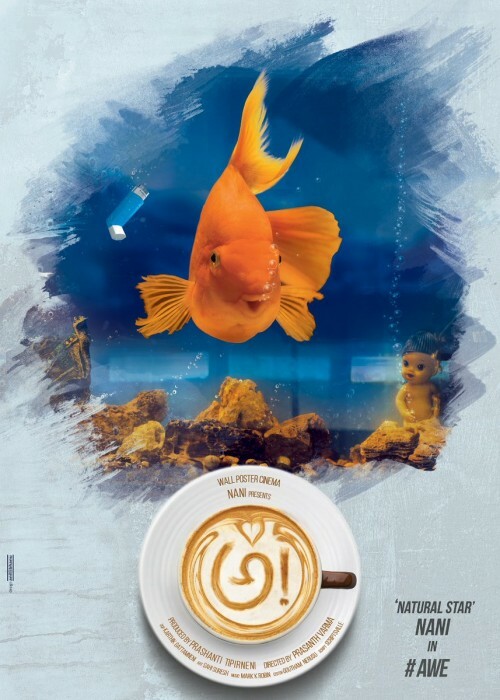 With Nani and Mass Maharaj Ravi Tej giving voice overs to the special characters in the film, AWE will certainly be drawing a lot of audiences to the cinema halls. AWE is directed by Prashanth Varma, a debutante, and is being produced by Nani along with Prashanthi Tipirneni. The story is the film is said to be set in a confectionary store and is said to be a thriller. On the other hand, Manasaku Nachindi starring Sundeep Kishan and Amyra Dastur is also gearing up for release this week. Manasaku Nachindi is being directed by Manjula Ghattamneni, daughter of veteran actor Krishna and sister of superstar Mahesh Babu, and will mark her debut as a director in Tollywood. Said to be a breezy romantic story, Manasaku Nachindi also stars Tridha Choudhary in an important role who made her debut in Tollywood with Nikhil’s Surya Vs Surya. Manjula is quite excited about the film and had said that the story is very close to her heart.